Every Sunday I reflect on my week, something I've learned or something I need to commit to. Go here for some of my old Sunday Reflections Posts. This week I'm kindof doing all three. 3) I never got rid of my Candida. Well, Number 1 is true. Number two is true except I did start cheating at times. Not full out cheats but I have been eating 10 carob chips here, a bite of my kids muffin there, ya-da, ya-da, ya-da........my sugar cravings are back and urging me to have a few carob chips here, a bit of my kids muffin there, ya-da, ya-da, ya-da. Which leads me to Number three. Don't get me wrong, I think my Candida is way down from when I started this Candida journey. My moods are way better. My cravings are a fraction of what they used to be. But is it gone? Nope. Do I think it would have been gone by now if I weren't breastfeeding, didn't need to be on those blasted iron pills, hadn't been poisoning myself with Chicory Root and my stomach hadn't been acting up all summer? Maybe. Grains - A small amount of non-glutenous are allowed if you can handle it - I can't. Can you really? I'm starting to wonder if anyone with leaky gut issues should be eating these? Sounds like NO FUN. Kinda of. But as compared to when I started this the first time I don't feel an overwhelming sense of panic. Probably because those sugar beasts aren't sending as many toxic off gases throughout my body and making me insane for sugar. And I know lots of great Candida friendly recipes now. Its hard. But its doable. And I'm throwing out a challenge. Do you think you might have a Candida overgrowth? You don't have to have the classic white tongue or recurring yeast infections to have it..........Click here for my main symptoms. 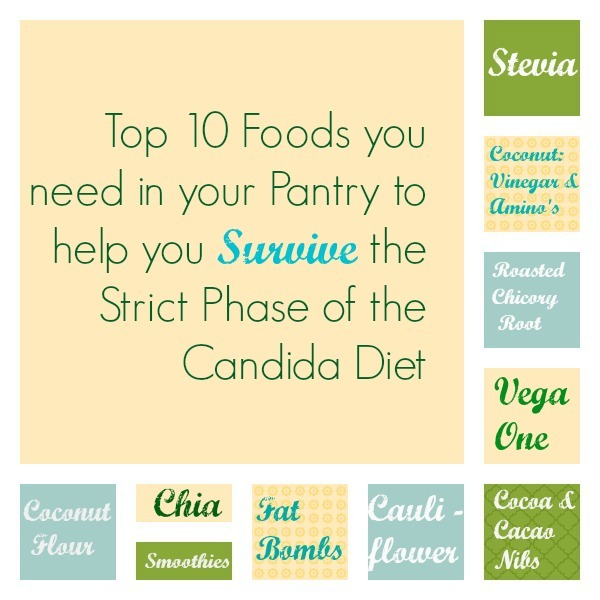 Do you know you have a Candida overgrowth but just don't want to deal with the diet? Do you CRAVE SUGAR ALL THE TIME? I challenge you to consider whether the Candida diet is something you need to do. It will be hard. I'm not going to lie. But you will feel so much better and in control of your life if you do. I already have one friend going for it - and I'm so proud of her. We are going to plan to treat ourselves when we get through it. Just not with food. So here are some of the foods that helped me get through this diet the first time. Keep in mind I figured a few things out since I first did this so my UPDATES ARE IN BOLD AND ITALICS. Maybe they will help you too! 1) Stevia - Praise God for Stevia. I really couldn't have survived without it. I probably use it too much but its better than the alternative - sugar, honey, maple syrup. Temptation is everywhere. So I get my sweet hit in baking, my coffee alternative, marinades and dressings from Stevia. You should try and buy the kind with no alcohol and stick to the liquid form. The powdered from has a weird taste and the fillers are not gut friendly. They also make flavoured Stevia like French Vanilla and Hazelnut Creme. It seems a bit expensive the first time you go to buy it but trust me - this stuff goes a long way. And is well worth every penny. NOW I'M USING TRUVIA, STEVIA AND ERYTHRITOL. I TRIED XYLITOL FOR A WHILE BUT I FOUND IT GAVE ME HEADACHES. 2) Smoothies - I can only eat so many eggs. And I need to eat on the run many days - sometimes many times per day so I need something that I can take with me. Enter smoothies. I make an amazing Chocolate Chia Vega One Smoothie and it honestly got me through the first couple weeks of this diet. Its still getting me through this diet. Plus its bloody delicious. Chocolate Vega One Protein powder is sweetened with Stevia (my go to) so its okay. Eat it for breakfast, snacks or dessert. Especially if you are about to cheat - it will curb your craving. I'M STILL MAKING THESE EVERYDAY BUT NOW I USUALLY USE FROZEN ZUCCHINI INSTEAD OF ICE. AND I ALSO MAKE VANILLA ONES. 3) 100% cocoa and Cacao nibs - I have a sweet tooth that won't quit and have a real penchant for chocolate. I adore chocolate. When I first went "clean and low-carb" I swore that the only way I survived the change was dark chocolate. I ate lots of 70% dark chocolate. Too much. Maybe that's why my Candida got so bad. So when I went on the Candida diet I was relieved to find out I could still have 100% cocoa and Cacao nibs. I use the cocoa in baking my "faux" desserts. And I have cacao nibs in my Vega One chocolate smoothies pretty much everyday. I love the bit of crunch and texture they give to the smoothie. And they are good in protein bars. What an awesome superfood. 4) Chia Seeds, Chia Seeds and More Chia Seeds - I have a serious love affair going with Chia seeds. I eat them ALL THE TIME. I eat about 2 to 4 Tbsp every day. I grind them up in my coffee grinder and use them in smoothies. I make them into Chia puddings. I use it as a replacement for eggs. I put them in my meatballs and burgers. Really - they are the wonder seed. I just wonder why I never heard of them sooner. 6) Roasted Chicory Root - This stuff has saved me. I never thought I could give up coffee. I did that by switching to decaf. And then along came Candida and I was told to give up decaf. Panic. But it was okay. I did it. I don't really miss it. I have a new, warm, rich, roasted friend to help me through my mornings. It is not the caffeine I need. Its the comfort. And I still get it. No - its not the same as drinking a sugar loaded french vanilla cappuccino. But its warm and delicious in its own right with some hazelnut creme Stevia and unsweetened almond milk. IT TOOK ME 3 MONTHS BUT I FINALLY FIGURED OUT THAT CHICORY ROOT WAS MAKING ME REALLY ILL AND EXTREMELY BLOATED. MORALLE OF THE STORY: PAY ATTENTION - MEDICINE FOR ONE PERSON IS POISON FOR ANOTHER. 7) Cauliflower - Who knew cauliflower was so versatile. And so sweet. Some weeks we go through 3 or 4 heads of cauliflower. Before we started eating clean I think we went through 3 or 4 a year. My favorite is to roast it with some EVOO and spices. But I also love it mashed, twice mashed, in Shephard's pie, as an alfredo sauce or in soup. The list goes on. Give it a try. Do something different with it. You will love it. And the long shelf life makes it handy to have around. 8) Protein Bars - Snacking is one of the biggest challenges with the Candida diet. So you HAVE to make some protein bars in the fridge/freezer for emergencies. You can grab a piece of fruit or yogurt when you are running out the door. You can't grab a muffin and coffee at Tim Hortons. You need to have something to snack on that is portable and ready to go. And I find protein bars are the best think for that. 9) Coconut Oil and Fat Bombs - I felt REALLY hungry on this diet. Still do sometimes. Eating a huge salad for lunch is great but sometimes I just need more fat. And a feeling that I finished my meal with a dessert. And just like the protein bars you need something around to snack on that will feel you up. Fat bombs made with coconut oil are just the thing. Buy yourself a chocolate mold and mix coconut oil with whatever combination of ingredients you like. Coconut, cocoa, cacao nibs, nuts, seeds, Stevia. Whatever. But have them in the fridge for when you need a "treat" or feel really hungry. They will help control your cravings and make sure you don't reach for a sugary or carbohydrate laden snack. 10) Coconut Amino's and Coconut Vinegar - These are a must have. When I first realized I couldn't have soy or vinegar I was freaking out a bit. How would I make salad dressing? What would I use to marinate meat? No worries. You can use coconut amino's and coconut vinegar on this diet. Problem solved. Now finding them might be a bit tough but chances are your local health store carries it. Or order it online. You will be glad you did. Good luck if you decide to take the challenge. YOU CAN DO IT! And don't forget to take probiotics and antifungals while you are doing the diet. I'm currently taking a probiotic, a Red Thyme Oil/Oregano Oil/Sage/Lemon Balm blend, garlic pills and Pau D'arco tea. And go to my Recipe Index for some Candida diet friendly recipes to help you along! Obviously any kind of change in diet/lifestyle should be discussed with your doctor if you have any concerns. Make sure you do your own research and understand what you are doing, why and how it can affect you before going for it. Just sayin'. Remember I'm an accountant and I'm being monitored my both a Naturopath and MD. Hi! How did you find out it was the chicory root? I have been drinking the dandy blend, which is so good, but want to make sure I know what to look for. Or do you recommend just not using the chicory root during a cleanse? I have a pretty extreme reaction - within 1/2 hour I look like I'm 5 months pregnant and have severe abdominal and back pain. You will probably know! Hi. I feel so blessed to have found you! I just found out I have Candida, Adrenal fatigue, allergic/sensitive to gluten, dairy, sugar, corn, a few fruits and veg. I'm working with a naturopath but the start seems rather daunting. Luckily we live where so much more is available to those of us with this issue. Just wanted to say thank you for your wonderful blog and all the best in your journey too!